It's a challenge to take 10 steps in Charleston without passing a landmark with some kind of historical significance. That's part of what makes this charming little city so special, right? Today, we'll be taking a deeper look at some of the buildings you may currently patronize as shops, restaurants, or event spaces and giving you a short history of what they once were before their modern makeovers. Let's start with the Charleston Music Hall. It's currently the number one music venue and event space in town, serving the community by bringing a whole new class of nationally touring acts that had been skipping over this old war town in the recent years. Over a century before it housed a stage for rock bands and stand up comics, it was part of a much larger complex known as the "Camden Depot". The architect, Edward C. Jones, crafted the building to make a train’s arrival at the station a dramatic experience. The depot complex was under construction in November, 1849, when it was reviewed by Edwin Heriot, writer for Debow’s Review (Nov. 1849). Heriot describes the building as a combination of “utility and chasteness…of the substantial and the ornamental.” The Tower Depot was designed to resemble a Medieval castle, but with an emphasis on symmetry and balance which was more characteristic of the Renaissance style. Jones decorated the building with projecting turrets, traceried lancet windows, pointed arch niches, sunken panels, and heavy doors. To complete this romantic allusion, there were even simulated arrow slots, as if yeoman were quartered in the tower to defend the building from assault. The building sat vacant and derelict for sixty years until finally, in 1995, the Bennett-Hofford Company facilitated the Hall’s amazing transformation into an arts venue. Next up, is the Garden Theater. First conceptualized as an old vaudeville house and then repurposed as cinema in the 1950's, it's one of Charleston’s most historic theaters. Designed by American architect, David Hyer in 1915 and erected in 1918, the theater ran successfully until closing in the 1970's. During the 1980’s, the theater was used for performances during Charleston’s famous Spoleto Festival and eventually transformed into a performing arts space. 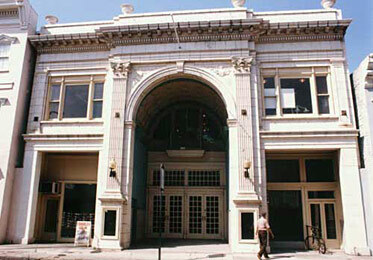 The City of Charleston did not renew its lease of the theater in 2003, and despite efforts of the Friends of the Garden Theater, the theater was converted into retail space, Urban Outfitters. It's sad to see the once stunning theater, now stand as a simple clothes shop, but at least they transformed the space without compromising too much of the building's architectural integrity. The Cigar Factory, located at 701 East Bay, is significant as a largely intact example of a late nineteenth century industrial plant built in the Victorian commercial style. The Cotton Mill of Charleston opened in late 1882. Work began in 1881, and the building was completed in 1882 for use as a textile factory. The factory was designed by A.D. Lockwood of Providence, Rhode Island and began operations in December 1882 as the Cotton Mill of Charleston. It is better known as the Cigar Factory, a name it acquired after The American Cigar Company purchased the property in 1912; the cigar factory remained in operation until 1973. During the 1930s, the factory was the largest private employer in Charleston with about 1400 workers generating more than 400,000 cigars daily. In the 1940s, the cigar factory was the site of a major strike by black workers. During the strike, worker Lucille Simmons, a choir member at Jerusalem Baptist Church, began singing the turn-of-the-20th-century gospel hymn, "I'll Overcome Some Day." The words of the song were altered while being sung. That instance marked the first singing of what would evolve into the popular civil rights anthem, "We Shall Overcome." For the past decade, the factory has been in the process of being converted into a loft community. Charleston is filled with these kinds of stories and interesting tidbits of information sometimes hiding under the foundations of the buildings we walk by everyday, so stay tuned for more installments of Then and Now from the blogging team at Colony and Craft. Also, feel free to leave us a comment if you know of a building with a story you'd like to see featured.